John “Chip” Tilton, MD, of Case Western Reserve University School of Medicine will receive $300,000 from the Dr. Ralph and Marian Falk Medical Research Trust to develop a virus-based “nanoPOD” (nanoscale PrOtein Delivery) platform to help treat rare genetic diseases. Tilton is associate professor and director of immunobiology in the Center for Proteomics and Bioinformatics in the School of Medicine. The seed funding, part of the Falk Catalyst Awards Program, will support one year of research into ways to effectively package therapies into nanoPODs, and deliver them to specific tissues in mice affected by genetic disease. Tilton’s project will address a major challenge in developing nanoscale therapeutics: finding ways to deliver them to the right location inside the body. Viruses, with their expertise in penetrating cells, represent vehicles that can be co-opted by researchers to deliver therapeutics. NanoPODs will be designed to treat diseases caused by genetic mutations. In particular, genetic mutations that introduce a “termination codon” into a growing protein, prematurely stopping protein synthesis. Such mutations represent approximately 10 percent of all genetic diseases and can lead to truncated, defective proteins. Depending upon their genetic location, the mutations can cause cystic fibrosis, muscular dystrophy, metabolic disease, and other debilitating conditions. Both strategies require delivering therapeutic molecules to affected tissues–either “suppressor tRNA” that helps extend genetic material encoding the protein, or nanoscale machinery that can modify faulty genes. “While promising, these treatments cannot be used in patients–yet–because we lack a technological platform to efficiently deliver the suppressor tRNAs or genome editing machinery to the diseased organs inside of patients,” Tilton said. Tilton plans to package the therapies into nanoPODs, infuse them into mice, and measure nanoPODs’ ability to safely deliver their contents to affected tissues. “The project is a really exciting bioengineering challenge to develop a system for delivering these drugs to the tissues where we want them in patients, while avoiding side-effects from delivering to the ‘wrong’ tissues,” Tilton said. The project has already involved researchers across Case Western Reserve University School of Medicine. Jeff Coller, PhD, director of the Center for RNA Molecular Biology, developed suppressor tRNA for nanoPOD packaging. Ronald Conlon, PhD, and Mitchell Drumm, PhD, both professors in the Department of Genetics and Genome Sciences, genetically engineered mice to have mutations found in human patients, plus bioluminescent genes to easily identify affected tissues. 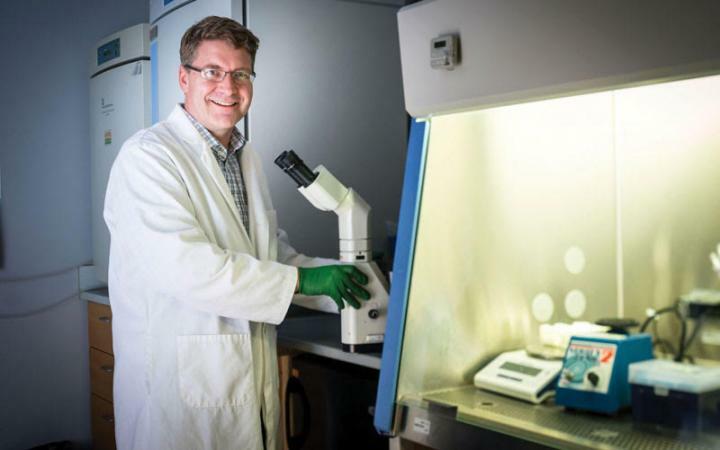 The researchers will use imaging strategies developed by Chris Flask, PhD, of the Case Center for Imaging Research to track nanoPODs working in the mice. Jirair “Jerry” Bedoyan, MD, PhD, director of the Center for Inherited Disorders of Energy Metabolism, and a pediatric geneticist who specializes in metabolic diseases that can be caused by premature termination codons, will advise the team from a clinical perspective. As a Catalyst Award recipient, Tilton is now eligible for the Falk Transformational Award Program, that provides an additional $1 million to researchers over two years to move their concepts further along the drug discovery pipeline. In total, Case Western Reserve University School of Medicine faculty have received four Falk awards: three Catalyst Awards (to Tilton, Menachem Shoham, PhD; and Xin Qi, PhD) and one Transformational award (to Shoham). Qi, 2017 recipient and associate professor of physiology and biophysics, is optimizing a therapeutic small molecule to strengthen mitochondria damaged by Huntington’s disease. The fatal, inherited neurodegenerative disease damages quality control mechanisms inside mitochondria, weakening their ability to support nerve cell function. Qi is using the Catalyst award to identify molecular targets within mitochondria that are modified by the small molecule, and to test the molecule’s efficacy in laboratory models of disease. Shoham, associate professor of biochemistry, used a 2014 Catalyst Award to develop small molecules that inhibit Staphylococcus aureus toxin production. With a 2015 Transformational Award, Shoham generated preclinical data to support testing the small molecule in clinical trials. Shoham’s results suggest the small molecules are effective against multiple bacteria species and may represent a new therapeutic option for sepsis. The project has been licensed to Q2 Pharma, a new Israeli biotechnology company formed to advance the approach. The Dr. Ralph and Marian Falk Medical Research Trust was created by Marian Falk in 1979 to fund “medical research to improve treatments of the past and eventually find cures for diseases for which no definite cure is known” (Falk Catalyst Awards Program). Bank of America, N.A., serves as Trustee for the Falk Medical Research Trust and The Medical Foundation at Health Resources in Action is pleased to manage the grant making for the Falk Award Programs on their behalf. The Medical Foundation also oversees other high-impact biomedical research grant programs to accelerate medical discovery and promote public health. For more information, please visit: https://hria.org/work-in-action/the-medical-foundation.